Discussion in 'Old Amaravathi' started by satish, Sep 14, 2015. Amaravati (Guntur): Historical Amaravati, once the capital region of ancient Satavahana Kings, will be preserved as a heritage city. The marks and foot prints of history of the bygone era will be revived for the benefit of history and heritage lovers. The Central government has earmarked Rs 100 crore and the Union Ministry of Urban Development has selected Amaravati along with 11 other historical cities in the country by sanctioning Rs 100 crores each to enliven the cities and to enable history lovers to go down the memory lane and delve into the past glory. Amaravati, an old and dusty city, but for its historical value, is presently a sleepy village with hardly any facilities for the tourists. Lord Gautama Buddha sitting on a massive monument in a meditation mood appears to be watching over the village and the people. However, to avail of the Central assistance, the State government has to upgrade the present Amaravati Village Panchayat into Nagara Panchayat. For the village to be upgraded, it needs to have a minimum population of 25,000. As of now, the population in the village is pegged around 13,400. So, the government is planning to merge the surrounding villages of Dhanyakataka, Muttayapalem, Lingapuram, Nadukullapadu, Yenikipadu, Thedamatturu and Yakuntapuram to get the tag of Nagara Panchayat. The Heritage City development involves laying of new roads, development of Buddhist theme park, in 500 acres, museum, pilgrim amenities, tourist kiosk and a foot-over-bridge from Dhana Buddha to Amareshwara temple. Life-size statues of eminent Telugu personalities will also be installed on the Krishna river bund. Meanwhile, the Endowments department under the 'Prasadam Scheme' also sanctioned Rs 70 crores for the development of temples and infrastructural facilities for the devotees who come from far off places. Summing it up, Amaravati Tahsildar K Nasaraiah told 'The Hans India' that the low-lying Amaravati would emerge as a famed heritage destination soon with the Central and State governments committed to invest Rs 170-odd crore together to spruce up the city which would attract even international tourists, particularly from the Buddhist countries like China, Japan and other South East Asian countries. Already, many of the Japanese firms and associations have evinced interest to contribute their mite for the development of Amaravati. The historical city is destined to shine on the international tourist map along with the new capital region christened as 'Amaravati'. The twin Amaravatiâ€™s would gain popularity in different ways- one reflecting the ancient glory, while the other showcasing ultra-modern civilisation. Various infrastructure and heritage conservation measures have been lined up for Warangal city in Telangana and Amaravati in Andhra Pradesh under the Heritage City Development and Augmentation Yojna (HRIDAY) of the Central government. A total of Rs.72.97 crore has been allocated for Warangal for infrastructure and amenities, of which Rs. 40.54 crore is under HRIDAY. Of this, Rs. 14.94 crore has been allocated for development of foreshore road, streetlights, parking and landscaping, Rs.15 crore for ropeway, Rs.5.37 crore for preservation of moat surrounding the fort, and Rs.3.85 crore for a museum at Fort Warangal. A total of Rs.20.33 crore has been approved for the seat of Buddhism at Amaravati under the scheme. Access to Dharanikota Fort, Amaravati Pondi, Mahachaitya Stupa, Amaralingeswara Swamy Temple, Kalachakra Museum, Dhyanabuddha Statue and Zamindar Bungalow will be improved with these funds, and an interpretation centre and a walkway of 2.5 kilometres will be developed. The HRIDAY Committee has urged the Ministry of Tourism to expedite approvals for projects worth Rs.32 crore under consideration for Amaravati. Action plans under the HRIDAY scheme have been approved on Tuesday at a total cost of Rs.431 crore by the HRIDAY National Empowered Committee chaired by Secretary, Urban Development Madhusudhana Prasad. Eight cities, Varanasi and Mathura from Uttar Pradesh, Ajmer from Rajasthan, Dwaraka from Gujarat, Badami from Karnataka, Vellankini from Tamil Nadu, besides Warangal and Amaravati will be covered under the scheme. The approved action plans seek to conserve and develop core heritage assets of respective cities besides improving sanitation through solid waste management, easy access through signages and better mobility, interpretation centres, landscaping, and provision of green spaces. Some projects for some cities have already been approved and funds have been released, a press statement from the Ministry of Urban Development informed. Cities have been divided into different zones for taking up different infrastructure development projects, it said. At present two mandals â€“ Mangalagiri and Tadepalle â€“ are covered by a rail network. HYDERABAD: The AP government has intensified efforts to secure a new railway line to the ancient Buddhist village of Amaravati after which the upcoming capital city of the state has been named. The state government feels that establishing a rail network connecting the three mandals that make up the new capital city with the rest of the country will boost tourism, particularly pilgrims from the Buddhist nations. At present two mandals - Mangalagiri and Tadepalle - are covered by a rail network. But the railway line covers only the peripheral areas and do not touch Tullur mandal, where the state administrative buildings including the Raj Bhavan and the state Assembly have been proposed. The state government has now sought an exclusive railway line to Amaravati village via Tulluru. This new line can be connected to Vijayawada on one side and Sattenapalle on the other providing national connectivity to existing Amaravati village and the upcoming Amaravati city. "The new railway line can simply be an extension of the existing Vijayawada-Guntur rail road branching off at Mangalagiri and running through Tulluru to Sattenapalle via Amaravati village. The Railways can also think of laying an exclusive railway line from Vijayawada to Amaravati along the Krishna river bund. Alternatively, a new railway bridge can be constructed across the river to provide connectivity to Amaravati from Rayanapadu (Vijayawada outskirts)," suggested Veeranjaneyulu Jasti, chairman of Amaravati Development Authority. "The issue is now under the consideration of the Railway Board," added Veeranjaneyulu, who had sent his suggestions to the Prime Minister's Office. The state government has also sought connectivity to Amaravati with Vijayawada-Chennai rail road on one hand and Hyderabad-Guntur line on the other. 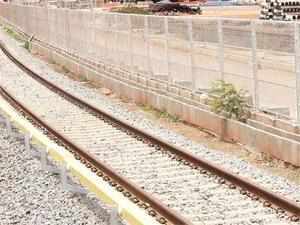 It has also urged the Centre to consider the feasibility of extending the proposed railway line from Amaravati to the Guntur-Nandyal line for easy access to Rayalaseema. Earlier this week, chief secretary IYR Krishna Rao directed CRDA principal secretary Ajay Jain to focus on rail connectivity to Amaravati. Chief minister Chandrababu Naidu too, had sought the South Central Railway to speed up the work on the proposal and provide rail connectivity to Amaravati village and city. Chief minister N Chandrababu Naidu and union minister M Venkaiah Naidu will lay foundation stone for taking various developmental programmes under Prasada and Hriday at Amaravati on Saturday. GUNTUR: Clearing the decks to give face lift to the ancient temple town-Amaravati, Union government has brought it under the purview of new programme- Pilgrimage Rejuvenation and Spiritual Augmentation Drive (PRASAD). The Centre had already included Amaravati in Heritage City Development and Augmentation Yojana(HRIDAY). Chief minister N Chandrababu Naidu and union minister M Venkaiah Naidu will lay foundation stone for taking various developmental programmes under Prasada and Hriday at Amaravati on Saturday. CM and Venkaiah Naidu would leave Vijayawada after laying foundation stone for Kanakadurga flyover in the city for Amaravati visit in the afternoon. Both would visit Kalachakra museum in Amaravati and lay foundation stone for comprehensive drinking water scheme in Amaravati town. They would visit Archeological museum and Dhyana Budha project site. CM and Venkaiah Naidu would address a public meeting at Dhyana Budha site at 3.30pm before returning to Vijayawada. Union minister for tourism and cultural affairs Mahesh Sharma would also be visiting along with CM and Venkaiah Naidu. Meanwhile, the district collector Kantilal Dande, SP Narayan Naik, local legislator Kommalapati Sridhar inspected the arrangements for CM's visit on Thursday. District collector said that they have already sent a proposal for merger of Dharanikota panchayath into Amaravati and upgrade it as nagara panchayath in order to get funds under Hriday scheme. While Amaravati town would get around Rs.20 crore under Hriday, another Rs.20 crore is being expected under Prasad in the first phase. Developmental works including providing access to Dharanikota Fort, Amaravati Pondi, Mahachaitya Stupa, Amaralingeswara Swamy Temple, Kalachakra Museum, Dhyanabuddha Statue and Zamindar Bungalow and an interpretation centre and a walkway of 2.5 kilometres will be developed under Hriday scheme. Although, the new capital city of AP has been named as Amaravati, the actual temple town of Amaravati is not part of the capital city area identified by the state government. Temple town Amaravati is located just 14km away from the capital city area. In order to give Philip to the development of the temple town excluded from capital city, it was clubbed in two important schemes launched by the Centre. The whole world is looking at Amaravati. This place will become a popular tourist destination. Amaravati land owners have been reluctant to part with their property. Chief Minister N. Chandrababu Naidu on Friday urged those who had filed writ petitions against the acquisition of 14.36 acres opposite the Dhyana Buddha Project to withdraw their petitions and pave the way for the development of the ancient town into a popular tourist destination. The 14.36 acres have been in the possession of around 40 families, and many of them have filed writ petitions in the High Court against the governmentâ€™s proposal for acquisition of land. Incidentally, with the prices of land in and around Amaravati hitting the roof, land owners have been reluctant to part with their property. With the land having been identified for the site where a heritage park has been proposed to be developed under the Heritage City Development and Augmentation Yojana (HRIDAY), a scheme of the Ministry of Urban Development, at a cost of Rs. 7.56 crore, local revenue officials have been trying to convince villagers of the need to part with their lands. â€œThe whole world is looking at Amaravati, and you should be aware of that. This place will become a popular tourist destination, and I urge you to cooperate with the government by voluntarily parting with your lands,â€ Mr. Naidu said. Entrusting the task of taking possession of the land to Pedakurapadu MLA K. Sridhar and revenue officials, the CM said bidding process would begin soon. Speaking of the advantages of land pooling, the CM said land owners in Tullur had already shown the way by parting with 33,000 acres and added that the government would implement the land pooling process to acquire lands for infrastructure projects, including highways. The whole world is looking at Amaravati. This place will become a popular tourist destination. Chief Minister N Chandrababu Naidu who launched the works of heritage city of old Amaravati on Saturday said that the AP Government will be continuing the collection of lands for developmental works under Land Pooling Scheme (LPS) and asked the public of old Amaravati to co-operate. Elaborating on the old Amaravati's bright future plans, Chandrababu said that the Dhyana Buddha project would be completed soon, asserted the need for accommodation and that the government will develop all basic amenities for the visitors in the city. The Chief Minister also shared that a Buddhist school is all set to begin by Himalayan Buddhist Association at old Amaravati to attract the foreign tourists, boat service in the waters of Krishna river, barrage construction at old Amaravati, laser show at Dhyana Buddha, boating facility in the Nunegundala pond and gardens in the Buddhist circuit. Chandrababu also added that a replica of the ancient fort of Dharanikota that was once a capital in the ancient times would be constructed by the government with monuments and sculptures to attract the tourists. Visitors to the 125 feet Dhyana Buddha project at Amaravati will certainly not miss an imposing pylon leading to the project site. The 25 feet pylon, inaugurated on Saturday by Chief Minister N. Chandrababu Naidu and Union Urban Development Minister M. Venkaiah Naidu, is modelled on the Maha Chaitya, the greatest architectural achievement of Buddhism. But building the pylon was not an easy task, more so, in less than 24 hours. On the instructions of Collector Kantilal Dande, Joint Director, Social Welfare, Guntur, R. Mallikarjuna Rao, set upon the task on Friday morning and racing against the deadline completed the work by Saturday. â€œApart from presenting the sculptural virtuosity on the grand stupa in the pylon, we also wanted people to know about the history of the stupa, its influence in shaping the Amaravati School of Art and finally, about the two projects, PRASAD and HRIDAY, which will give a complete makeover to the ancient town,â€™â€™ Mr. Mallikarjuna Rao told The Hindu on Sunday. The idea was to build an impressive pylon and Mr. Rao mobilised 200 workers. A pit measuring 25 X 25 feet was dug and after filling it with sand, a concrete bed was built on which a pedestal measuring 14 X 14 feet was built. Four plaques, beginning with the names of the Chief Minister and Ministers as per the protocol, information about the Heritage City Development and Augmentation Yojana (PRASAD) and Pilgrimage Rejuvenation and Spiritual Augmentation Drive (HRIDAY) and a brief history of Amaravati, were built. On either side of the plaque, two pre cast slabs with drawings of Amaravati sculpture presenting the teachings of Buddha, were arranged. And finally, on the top of pedestal, a statue of Buddha in a meditative posture, was erected in a ring. The imposing pylon, was appreciated so much, that the officials of the Union Urban Development Ministry indicated to the other cities included among heritage cities, to build similar structures. The Andhra Pradesh government plans to set up a grand museum in memory of Dr. Babasaheb Ambedkar at Amaravati to mark the late leaderâ€™s 125th birth anniversary, according to senior TDP leader and A.P. State Scheduled Castes Cooperative Finance Corporation Chairman Jupudi Prabhakara Rao. â€œThe government wants to attract in a big way national and international tourists to Amaravati, especially from Southeast Asian countries, where Buddhism flourishes, by setting up a memorial for Dr. Ambedkar who became a Buddhist in later years,â€ he told reporters. The memorial would come up on a 15-acre plot close to the mammoth Buddha statue to mark the 66th year of the adoption of Indian Constitution drafted by Dr. Ambedkar, he said, adding that the proposed memorial would rival the one in Nagpur. The memorial would house an international research centre, library and a study circle for the Dalits to draw inspiration from the life and history of Dr. Ambedkar, he said.